Title : Balloon Toons: Hiccup! Genre: Hiccup by Mike Herrod, is a realistic fiction graphic novel. This story uses made-up characters, Jamie and Jenna. Jamie gets hiccups the day of the big play. Jamie and Jenna try everything they can think of to cure his hiccups before he goes on stage. Just minutes before they go on Jenna has a great idea. She thinks a kiss will make the hiccups go away. Jenna chases Jamie around and finally kisses him. To much surprise Jamie’s hiccups were gone and he went on stage with no hiccups. This is a story that could happen in real life. Target Audience: Hiccup is targeted towards primary students from first to third grade. This graphic novel has simple vocabulary, simple sentence structure, pictures, and is easy to understand. Text-to-Self	This graphic novel reminds me of myself as I can relate to the main character Jamie. I frequently get the hiccups and have a difficult time getting rid of them. Although I have never had the hiccups for two days, I have had them last a few hours. In high school and college I was know for always getting the hiccups. My friends would say, “Oh no! Claire has the hiccups AGAIN!” When I was reading this book, it made me laugh how many different and silly cures they tried, however, I can sympathize with Jamie that cures do not typically work. Text-to-Text	This text is different to other things I have read because it is a graphic novel. I do not typically read graphic novels and can not remember the last one I read before this class. I find graphic novels harder to read than chapter books. 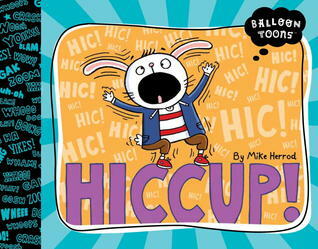 Hiccups reminds me of another text I have read, Arthur’s Hiccups by Marc Brown. As a kid I was obsessed with Author. I read all of the books and watched every TV show. Arthur’s Hiccups is when Arthur gets the hiccups and his friends and family try everything they can think of to try to get them to go away. He tries silly things such as standing on his head, licking a lollipop while hanging upside down, and laughing, These two texts are very similar in that the characters try anything and everything they can think of to cure the hiccups and nothing works. Text-to-World. In the story, Jamie has the hiccups and cannot get rid of them. Jenna and Jamie try all day to cure his hiccups. Jenna, Mr. Beaker Bottom, Coach Bloat, and Lady Lunch Linda all try to help Jamie cure his hiccups before the big play. This relates to the world because when people have a problem they usually have a friend or family member there to help them or cure their problem. In addition, this relates to the real world because many people get the hiccups and have a hard time curing them. Hiccup is an adorable graphic novel for young/beginning readers. It a story about the main character who has a bad case of the hiccups and his friend is trying to do her best and do all these crazy remedies to help him get rid of them before the play. In the end the thing that scares the hiccups out of him is a little kiss she gives him before the play. This book had awesome illustrations that have vibrant colors and grasp the readers attention, there isn't many big vocabulary that might make it hard for readers to understand and that makes it a fun and easy to read, short book. Balloon Toons graphic novel that will have kids giggling. Jamie is nervous about his first big performance in the school play, but things really get hairy when he comes down with a monster case of the hiccups. He patiently tries all his friends and teacher's crazy remedies, but the cure is just too "horrible" to be believed! Adorable. I loved this fun and light-hearted tale of a bunny who simply cannot stop hiccuping. Children of all ages can enjoy this story, and will want to read it over and over again. It is especially perfect for reluctant readers, who will delight in the wonderfully done illustrations. The story builds to a hilarious ending, sure to please everyone! Looking for something a little different to read with your child or a student this Valentines' Day? Jamie has the hiccups, will he and Jenna be able to find a cure before their play begins? What could the cure possibly be? Short, quick read. Solid story line with logical flow and full story arc. These Balloon Toons books make a great supplement to early readers, with lots of visual clues and the motivation to read provided by comics. This was a fantastic funny read.